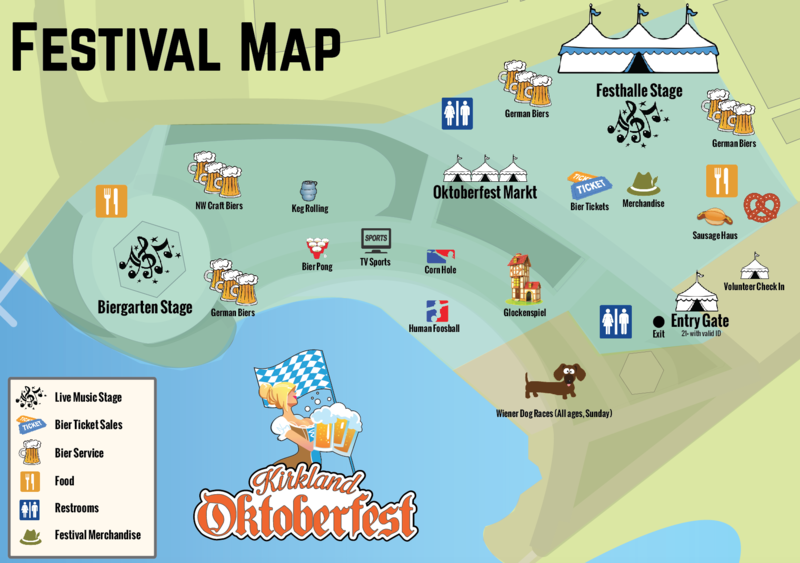 Oktoberfest returns to Kirkland September 21 to 23. Oktoberfest returns to Kirkland, Washington this weekend for three epic days of cold bier (beer), hot sausages and plenty of sizzling oompauh. First off, Oktoberfest is not a tasting garden. Oktoberfest is a full-on authentic German Oktoberfest biergarten. Period. The 6th annual festival is the Seattle area’s largest authentic German biergarten and includes multiple entertainment stages, games and competitions. The muchen-style biergarten includes the Festhalle (long tables swaying arm-in-arm), and SportHaus (football, corn hole, beer pong, stein hoisting and keg rolling). Only the best imported German and Northwest craft brews will be served over the three-day festival, which overtakes the waterfront in downtown Kirkland. After you have burned a few calories, or consumed them, Bavarian-style cuisine will be available at the Pretzelhaus or the numerous food trucks on site serving local bites. If Sunday is your dog’s day to shine, Oktoberfest is the place to be. Sunday, September 23 is Dog Day. The 6th Annual Great Kirkland Oktoberfest Wiener Dog Races begin at 1 p.m. Click here to get your dog registered. Oktoberfest runs Friday, September 21 from 5 to 11 p.m. The festival picks up again Saturday, September 22 from noon to 11 p.m. and ends Sunday September 23 from noon to 6 p.m.
Oktoberfest takes over the downtown Kirkland waterfront in Marina Park, located at 25 Lakeshore Plaza Dr., Kirkland, WA. Click here for the festival map. If you are unsure about dressing up in your finest authentic German attire, allow us to bring some peace to your life. If you are a guy, wear your Lederhosen. If you are gal, wear your Dirndl. If you’re in between, feel free to wear either. There will be contests for Mr. and Miss Oktoberfest so be creative and come dressed for success. You must be 21 years of age or older to enter Oktoberfest, including the Biergarten, Festhalle and Kraft Bier Keller. General admission tickets will gain you entry to Oktoberfest where everything is a la carte. You can also purchase tickets that include bier (beer) tickets. Oktoberfest supports the Kirkland Downtown Association and MEOW (Mercer Island Eastside Orphans and Waifs). The festival benefits the American Cancer Society, Eastside Timebank, Relay for Life, Sibling House, Imagine Housing and Rotary Club of Kirkland. For more information on Oktobertfest such as tickets, volunteering, event details and transportation, visit oktoberfestkirkland.com. Oktoberfest is brought to you by Chump Change, who reminds everyone to drink responsibly. Complimentary water is available to all designated drivers.